I'm out buying you some new clothes. I know you've been locked away for awhile, but no one's wearing orange this season. Gossip Girl Season 4 Episode 11: "The Townie"
You can't show up at a masked ball and not expect at least one social climbing doppelganger to try and impersonate you. She wants you all to think she's the perfect host and mother and wife, but the truth is she's a selfish liar who will destroy anyone that gets in her way. 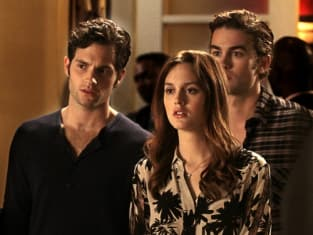 Gossip Girl Round Table: "The Townie"